E.T. 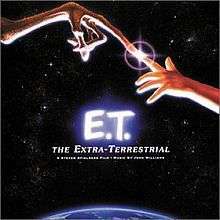 the Extra-Terrestrial: Music from the Original Soundtrack is an album containing John Williams' score for the 1982 Steven Spielberg film of the same name. The soundtrack for the film has actually been issued numerous times. The original issue was a recording of concert arrangements based on the film's music. Later issues contain the actual soundtrack cues as heard in the film, although most cues are alternates originally recorded for the film, but replaced by new cues. The score was recorded in Los Angeles, and thus not using the London Symphony Orchestra. On the track "The Magic of Halloween," when E.T. sees a child wearing a Yoda costume, John Williams included a portion of Yoda's theme, which he had composed for The Empire Strikes Back in 1980. The score was the fourth in history to accomplish the feat of winning the Oscar, Golden Globe, Grammy, and BAFTA (the previous two, Star Wars and Jaws, were also composed by Williams, who remains the only person to have won all awards for the same score more than once). To date, a total of only six scores have won all four awards. Many observers have noted that the E.T. theme music sounds extremely similar to a passage near the end of Czech composer Antonin Dvorak's Dumky trio, leading some to accuse Williams of "stealing" the music. However, others have pointed out that it is not an uncommon practice for contemporary composers to borrow from classical music. ↑ Tucker, Evan (2011-11-27). "Mein Blog: How John Williams Stole the ET Theme". Mein Blog. Retrieved 2016-07-28. ↑ "Patterico's Pontifications » John Williams, Thief Borrower: The Proof". Retrieved 2016-07-28.